Mumbai- The city of dreams is a heaven for hosting your wedding day as it offers some of the most fabulous and attractive banquet halls. From organizing a sangeet ceremony, engagement party to hosting a reception night or sangeet function—you can chose the best banquet space with great customer service and up-to-date facilities. Here’s a quick glimpse of the top wedding banquet halls located in Mumbai. Renaissance in Powai is a beautiful venue to host your wedding day. Nestled along the banks of the serene Powai Lake, this luxury hotel features winding walkways through lush greenery, beautifully-designed rooms and suites, the best culinary offerings and a vast indoor and outdoor banquet space. You can choose between the breathtaking Grand Ballroom, with its soaring ceiling and posh décor, and the gorgeous outdoor areas — the verdant Renaissance Garden or the terrace overlooking the lake. You can even have a beautiful wedding ceremony right on the banks of the lake! If you're planning to host a dusk wedding, you could have an impressive one at Mumbai’s Novotel. The beautiful hotel has a poolside lawn that faces the Arabian Sea. The spectacular sunset view from this lawn will make you fall in love with the ambiance it creates in the evening. How about taking your wedding vows against the backdrop of a sky painted in shades of pinks, oranges and violets? What else? The venue also has a separate entry that is available for the baraatis. If you prefer an indoor function, the venue’s Champagne Ballroom combines the best of modern technology, contemporary décor and classic luxury options that will give you an unforgettable experience. One of the most luxurious hotels in the city, Sahara Star, Mumbai, has the largest event hall. The extravagant banquet space includes the central hall, two annexe halls of 6,000 sq. ft. each and a grand pre-function space. The venue is accentuated with majestic elongated chandeliers, contemporary interiors and a 25-feet-high ceiling that add to its appeal. If you want to host a smaller reception, choose the Jade Ballroom as it will perfectly fit your needs. With the dark mahogany walls and gold accents, the venue offers elegance combined with minimalism. The Oyster and Coral banquet halls are perfect for smaller celebrations or pre-wedding ceremonies. Blue Sea, Mumbai, is one of the finest luxury banquets in the city with unmatchable facilities. It is located in the upscale area of Worli Sea face, offering breathtaking views of the Arabian Sea and glittering Bandra-Worli Sea link. Its plush main hall with contemporary interiors is perfect for hosting your wedding day. It also has an attached open-air patio that works beautifully as a dining area that is complete with buffet tables, seating and live counters. The venue has a hardworking team of experienced professionals from the luxury banqueting industry. Be it a traditional mehendi, haldi, sangeet or your wedding ceremony, the venue has a panel of florists to create theme-based decorations and innovative centerpieces for your event. Its food and beverage team offers customisable services and makes sure you can pick from a range of delectable Indian and international cuisines. Kino Cottage, a charming and offbeat venue, offers the best services. It enjoys proximity to the Versova Metro Station and has a magical ambiance on the beach. With its nature-kissed, pebbled pathways, wood and stone-carved benches, blooming flowerbeds, dense foliage and a breathtaking view of the Arabian Sea through the Versova Beach, the venue is just perfect for your intimate wedding reception or pre-wedding parties. The indoor banquet area has gleaming floors, stone arches and cane-woven furniture; all bathed in a warm golden glow. If a beautiful beach-front wedding was your dream, then see it come true at the Sun-n-Sand Hotel of Mumbai. The luxurious hotel has an open lawn section with an adjoining poolside and stunning views of the Arabian Sea, making it a perfect setting for a reception under the starlit sky. It also offers two indoor banquet halls that are best-suited for some fun and quirky pre-wedding functions like your sangeet or mehendi ceremony. You can be rest-assured about the hotel’s experienced and efficient team, which is well-equipped to plan and implement all aspects of your event, be it the menu, suppliers, timings, alcohol, seating plans, etc. Hotel Tip Top Plaza has gained its reputation as a "marriage multiplex", thanks to its ten luxurious banquet halls that are equipped to host varying capacities of guests. The royal interiors of the banquet halls will be a plus point if you want to host a grand wedding. Whether you're planning an engagement, a sangeet party, mehendi ceremony, cocktail soirée or lavish reception, Hotel Tip Top Plaza is bound to have something to suit your event needs. Kohinoor Hotel is known for its hospitality. Located just across Chakala Metro Station, the venue enjoys proximity to Andheri East's business area for convenience. The banquet hall has carpeted flooring and a well-lit ambiance that will add to its beauty. It is completely equipped to deal with all kinds of wedding events, be it a small pre-wedding party or a lavish reception. The banquet space and poolside lawn, when combined, make for a great venue to organise your private parties and receptions. 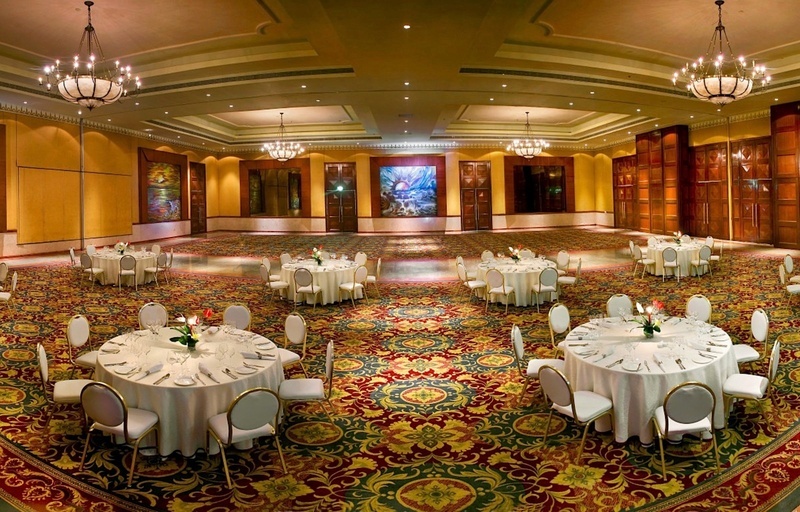 With a luxurious banquet and conference space, The Lalit, Mumbai, is one of the most coveted venues in the city. Its 8,100 sq. ft. pillarless Majestic Ballroom lives up to its name. It has plush, vibrant carpeting, high ceilings and regal dark-wood doors that make it ideal for that large-scale reception you've been dreaming of. Forum's wood-panelled, pillared room is great for weddings, conferences or breakaway sessions, while the Royal & Regal Rooms are more suited for smaller private functions like sangeet or mehendi. The venue’s vivid artwork and decorative chandeliers add an elegant touch to Quorum, which is equipped with modern facilities. And if you prefer an outdoor area, have your haldi-mehendi by the poolside on a lovely winter evening. The Lalit has a team of event planners and caterers that will create an exotic décor and customised menus, which will truly complete your special occasion. Athena Banquets in Mumbai is a prominent space to organise your wedding. The venue has an indoor wedding banquet as well as a terrace that can be used for dining. It has beautiful interiors in beige and brown colours. The false ceiling and tiled walls add a modern appeal. It has a clear glass partition that divides the banquet and terrace, showcasing the natural greenery on the other side. If you wish to host a wedding with a beautiful view, this is the right place!